2. OEM Accepted: We can produce any your design. Just a simple image, we can do perfect complicated goods out! This set of 4 illuminating light-up Rubber Duckies by Holy International Group Limited is a great gift for babies and young kids. 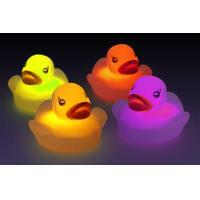 These rubber ducks are made from PVC and light up instantly when placed in water, or can be activated outside of water by touching the sensors on the bottom. Each duck is the perfect size to fit in a baby's hands. After use, it is recommended to dry the bottom of the duck to ensure a longer lifespan.We perform quality control procedures on all of our products mass production process to ensure our customer is getting a quality product guarantee. f) Key chains toy and so on. Our factory have been in compliance with Disney Audit, BSCI Audit, and ISO Audit. With rich production experience and top-grade workers , our products always meet customers' expections and on-time deliverying. Our customers come from all over the world .